The precipitous peak of Mt. 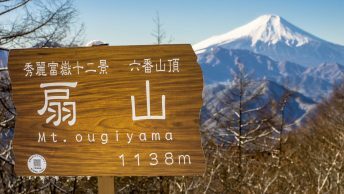 Kasamaruyama 笠丸山 (1,189 m) is located in Ueno Mura 上野村 in the back blocks of Gunma Prefecture. This still relatively unknown rural community came to prominence back in August 12, 1985 when Japan Airlines Flight 123 on route from Haneda to Itami Airport plunged into the nearby Osutaka Ridge 御巣鷹の尾根 killing 520 passengers. This disaster still ranks as the deadliest single-aircraft accident in history. Our initial plan was to make the 90 minute hike to the crash site to pay homage but a landslide earlier this year meant instead visiting the Ireino Sono Shrine 慰霊の園 in the main village which also commemorates the victims including some 21 non-Japanese passengers whose names are inscribed onto stone plaques. Ueno Mura has a plethora of outdoor offerings and to the village’s credit they have published a comprehensive free guide map which includes many of the hikes in the area available here or at the michi no eki along the main road. The round trip to Mt. 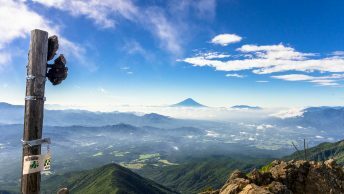 Kasamaruyama takes 3-4 hours and includes spectacular 360 degree views of the surrounding township. Getting to the trail head necessitates using a car, taxi or walking 60 minutes (4 km) along an unnamed road which runs north of route 299 just before the Fubo Tunnel 父母トンネル. Heading out from the car park the trail crosses a small river and follows a little used access road for around 500 meters. The path then enters a sheltered broadleaf forest where you are welcomed by a chorus of humming cicadas and the occasional leech. Some trail erosion makes the going a little tough to but after climbing for an hour you reach Jizoutoge Pass 地蔵峠 which intersects with another forestry road. For the next 30 minutes you remain on the ridge climbing towards the pre-summit viewing point. Near the top some ropes are judiciously placed which are gladly received. From here you have a line of sight towards the Ueno Sky Bridge 上野スカイブリッジ and Osutaka Ridge. 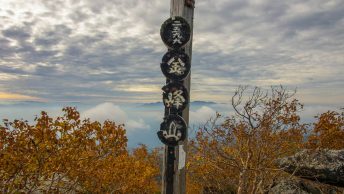 After another five minutes you finally come to the true summit (1,189 m) where a small shrine has been erected. The final loop back to the car park takes around 90 minutes and again some sections are roped for a safe descent.